Regular team gatherings here at LKT have come to be known as “LKTeam Days” and provide excellent opportunities for everyone in the team to participate in CPD, take stock of how the team is developing, and – with some team members working off-site – catch up in person. Even better, they are entirely home-grown enterprises, with the content of their CPD components created from scratch in-house and presented by various team members. The latest of these special days in the LKT calendar came around on Friday 19 October and was every bit as interesting and enjoyable as the ones that had come before it. 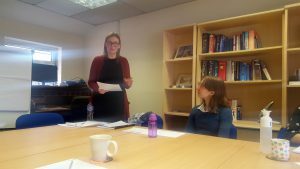 Two presentations were on the agenda this time round, the first of which was an interactive talk on SEO (search engine optimisation) given by Catherine, one of our Senior Translators. The profile of SEO has risen recently in the translation industry as customers increasingly recognise that the language used on their online stores and platforms needs to be crafted in a way that drives attention and sales. Catherine drew on insights gained from presentations on the subject that she had recently attended, and explained that customers who are looking for texts optimised in this way may require translators to adopt a slightly different perspective on how they choose terminology. Moreover, there may be the need for some compromise between prescribed glossaries and actual target-market usage. The team spent some time discussing how it could adapt its approach in texts that are intended for online usage, and the extent to which it needed to. While applying SEO principles to texts is a skill that translators may need to hone more as demand from customers grows, at the same time it requires abilities that translators should already have – such as familiarity with the target culture and words that are in common parlance. The next presentation of the day came from Louise, our Director, and discussed the CPD that the team currently undertakes as well as how this could be developed as we move into the future. The team already operates on an excellent foundation of CPD: its various members attend conferences and webinars, read and write articles, and our in-house developments such as the LKTeam Days themselves and the Translator Academy are both examples of how we have created our own CPD where we have seen the need. However, there is always room for improvement and plenty of untapped opportunities still to be gained, so the team discussed the other avenues that could be explored and how our approach to CPD could be better structured. By the end of the session, we all had a firmer idea of the kinds of activities that we could and should be entering as CPD in our in-house log, and a better vision of how our participation in CPD would look in the years to come. No LKTeam Day is complete without a special lunch, whether that means heading out somewhere or ordering pizzas for the office! This time, our destination was Madisons Restaurant in Rochdale, where we enjoyed some delicious food before finishing our gathering for the weekend. The next get-together will find the team in Rochdale once again as we attend the annual Rochdale Business Awards at the beautiful Town Hall. Watch this space (and our Twitter page) for our report on the night!